1) A short City Tour: History records that in 1502 Christopher Columbus landed in Costa Rica at the place known as Puerto Limón. The country's port par excellence thanks to import and export traffic, Limón now has the facilities to receive cruise ships as well. The city's old quarter has the characteristics of a historical center and is currently under urban renovation with restoration of buildings and a pedestrian walkway from Parque Vargas to the market. 2) A Visit to the Rain Forest. La Jungla Trail offers a 1 km trek through a secondary forest offering beautiful landscapes, various flora and fauna, and including many opportunities to see the remarkably fascinating different frog species of Costa Rica, for example the red dart frog (dendrobates pumillo). Inside the trail, among the abundant fauna visitors may witness the 3 toed sloths and see the different species of birds: Toucans, Oropendola, Tanagers, Hummingbirds, kiskidees and much more, squirrels, and the majestic butterflies that swarm through the trail. The creeks which appear during the trail, add a crisp freshness to the air, yet more importantly enable the reproduction of many of the organisms living there. For example these creeks create the perfect atmosphere for the various types of frogs you will encounter, allowing the perfect place for egg laying. You will witness the beautiful flora, such as the epiphytes, orchids and bromeliads as well as other ground level plants with various sized leaves appearing in their plenty. The different species of trees ranging from young to old, small to large, serve as homes to many of the creatures being large mammals to tiny insects. These trees as you will witness are also adorned by the lianas that hang from the branches. 3) Visit a Banana Plantation and Packing House, where many interesting facts about this amazing fruit will be explained: The Crop, harvesting, processing, packing and exportation. 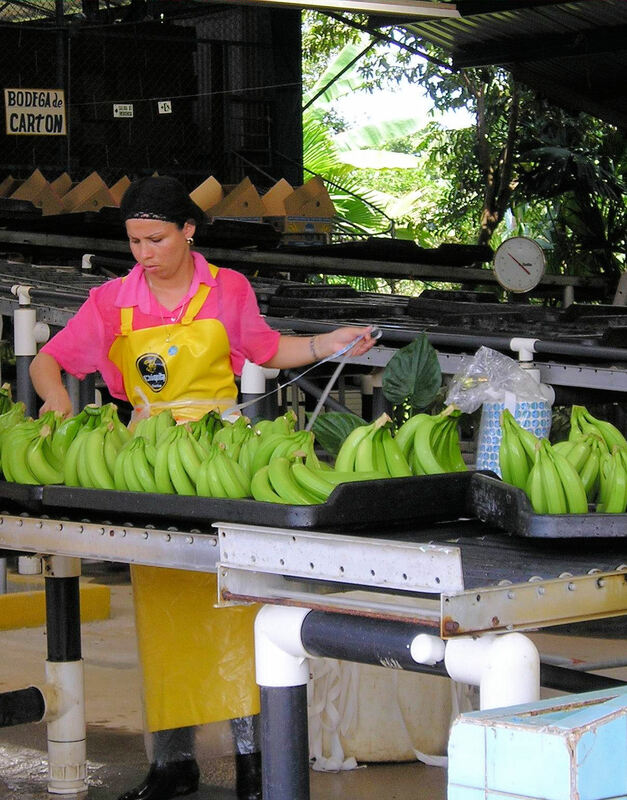 Costa Rica is the second largest banana producer in the world and 80% of the plantations are located in Limon province, becoming one of the most important economical activities in the region. During weekdays, you will be able to see the workers doing their job in the fields and the packing house. A very interesting cultural experience that you can’t miss. 5) The Tortuguero Canals: Board your covered boat for a 60 minutes leisurely cruise through the jungle canals. Your guide explains the rain forest eco-system and points out sights of interest. Keep an eye out for wildlife including howler monkeys, many sloths, toucans, aquatic birds, bats and crocodiles as well as exotic flora. 6) Enjoy the Souvenirs Stores & Shopping: During our Limon Highlights tour, you will enjoy many different souvenirs stores. The Caribbean enjoys a diversity of cultures: Afro-Costa Rican, Bribri and Cabécar, Asian, Italian and Central American, among others. Besides food, the region features a collection of cultural activities and traditions that also differentiate it from the rest of the country. You'll have time to visit souvenir shops and do some shopping while in Puerto Limon. In some places there is no shade so it is recommended you bring sunscreen, a hat and sunglasses. During rainy season, September through December, you might want to bring along a raincoat.